First time I look an insurance policy, I waited with my mother in a government building for hours. It was a cumbersome, lengthy and delayed process. No wonder, my zest for investment died then and there. Our generation likes to work fast, without any hiccups. We want things to be available at our fingertips. And why not? Also, if it involves our money, we should know the finer details of it. But there is always a question of trust when it comes to handling money matters online. Well, no worries! Check onlinelifeinsurance.com - with the backing of three reputed financial organizations, this microsite is the solution for our insurance needs. 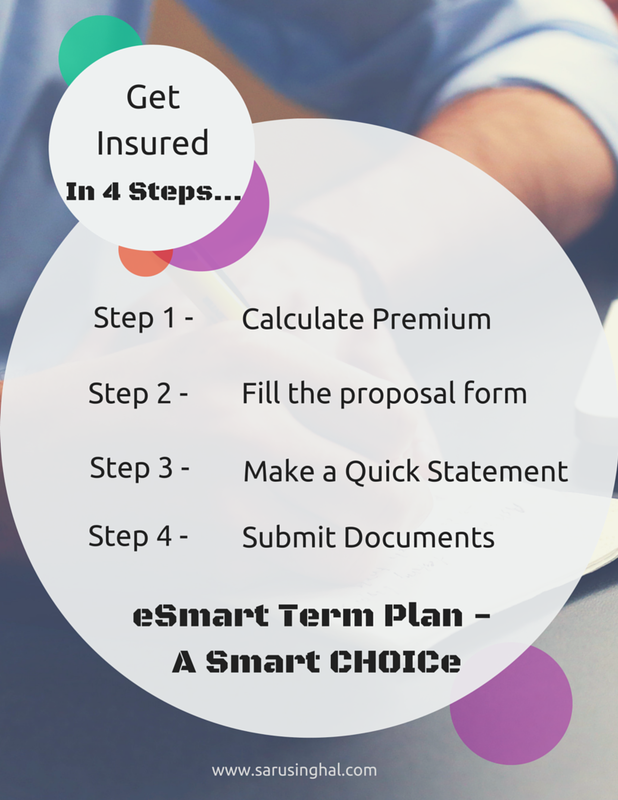 As I am revamping my financial plan for the year to include more investments, eSmart Term Plan caught my attention. I am looking for a long term policy to cover the contingencies. And ‘eSmart Term Plan’ fits the bill perfectly. It’s a term plan with a surprisingly low premium. To be very honest, ease of getting this plan is more inviting. When I heard about the site, I checked it on my mobile. The information on the website is simple to understand, unlike the legal mumbo-jumbo one reads on insurance related documents. The website is for the common man who is looking for a simple insurance policy from the comforts of home. If you wish to communicate with their insurance representative, fill in your name, email and phone number, and they will contact you. Yes, it’s that simple! No waiting at some office to get things done. It’s simple - Minimum documentation, minimum hassles. All the paperwork will take less than 10 minutes. Affordable - Annual premium for 50 lac policy is as low as INR 3878* Interested, check their online calculator to get a quote. Reliable - It’s a venture of HSBC, OBC, and Canara Bank. These organizations have a long-standing reputation of transparency and trust. To add more to the ease of investors, the policy has two major advantages. One, accidental death benefit, which if opted will entitle the family members to an additional amount to the sum originally insured. Two, family assistance, where a specially assigned manager will look and work with you, if need be. Isn’t the best thing! I have seen family members sweating over unresolved insurance issues. Adding such personal touches win many brownie points and not to forget loyal customers. No wonder this brand has already won many awards! After going through these features, I am positive, I will invest with them. And, will also recommend it to near and dear ones. I find the game of investments really tough! I leave that to my father and husband! It's always better to leave to those who are aware of the finer nuances. You can recommend them this website. It's really good. This sure looks good, |Saru! It is a good investment option. E-Smart term plan , onlinelifeinsurance.com - with the backing of three reputed financial organizations, this microsite does look like the easy solution for our insurance needs. Family assistance advantage sounds good. It is one of the best features.